Like ClusterSequence with computation of the active jet area. Definition at line 63 of file ClusterSequenceActiveArea.hh. enum providing a variety of tentative strategies for estimating the background (e.g. non-jet) activity in a highly populated event; the one that has been most extensively tested is median. These strategies are OBSOLETE and deprecated (see comment for pt_per_unit_area). Definition at line 90 of file ClusterSequenceActiveArea.hh. Definition at line 76 of file ClusterSequenceActiveArea.hh. Definition at line 78 of file ClusterSequenceActiveArea.hh. Definition at line 81 of file ClusterSequenceActiveArea.hh. return the transverse momentum per unit area according to one of the above strategies; for some strategies (those with "cut" in their name) the parameter "range" allows one to exclude a subset of the jets for the background estimation, those that have pt/area > median(pt/area)*range. NB: This call is OBSOLETE and deprecated; use a JetMedianBackgroundEstimator or GridMedianBackgroundEstimator instead. Definition at line 276 of file ClusterSequenceActiveArea.cc. The selector passed as an argument needs to apply jet by jet. Definition at line 445 of file ClusterSequenceActiveArea.cc. 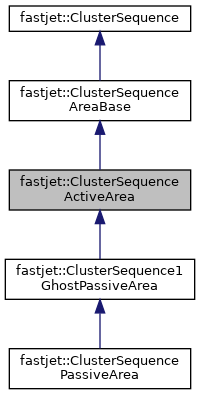 Definition at line 53 of file ClusterSequenceActiveArea.cc. 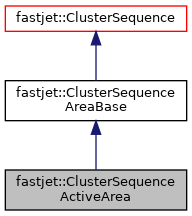 Definition at line 566 of file ClusterSequenceActiveArea.cc.